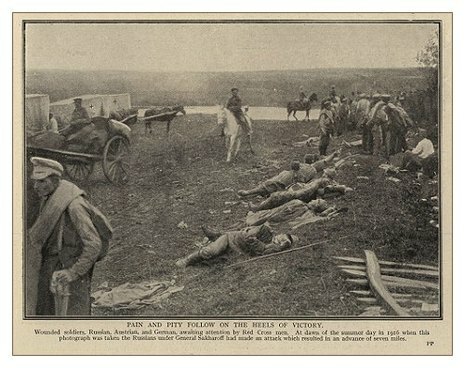 The Russian Armies, though staggered by the loss of a million men during their headlong retreat from Warsaw in the closing weeks of 1915, still possessed the essential power of recuperation. As the spring of 1916 approached, so rapid was their recovery, they were able to reorganize on the Dvina line, seize the initiative anew and launch a powerful offensive against the combined Armies of Germany and Austria. In a whirlwind campaign, after rupturing the Austrian line on a wide front, the Russians dispersed two great Austrian Annies, reconquered all of Bukowina and the greater part of Galicia, and forced the Teutonic Armies to retreat 50 miles behind their frontiers. In Transcaucasia the Russians were equally successful. Armenia was freed from Turkish dominion and the victorious armies of Grand Duke Nicholas then turned southward with Constantinople as their goal. Once again Germany and her allies were threatened with disaster and once again they were saved from annihilation through the evil machinations of the pro-German conspirators at the Russian court who so contrived that the necessary arms and munitions were withheld from the Russian Armies. Let us now examine in detail the Russian operations during the crucial year of 1916. Under the direction of General Alexeieff, Chief of Staff, the 720-mile battle line was reorganized in January, 1916, the Czar's armies being divided into three groups. In the Northern sector, from Riga south to Dvinsk, the command was vested in General Kuropatkin, the old Commander-in-Chief in the Russo-Japanese War. In the middle sector, between Dvinsk and the Pripet marshes, the army group was directed by General Ewerts. In the Southern sector, from the Pripet to the Dniester, General Brusiloff was in supreme command, with General Kaledin directing the Volhynian Army, General Sakharoff the Galician Army, General Lechitzky the Bukowina Army and General Lesh an Independent Army, facing the Bukowina border. At this time the fighting strength of the Russian Armies did not exceed 1,500,000 rifles, but by early summer there were some 2,000,000 Russian soldiers on the battle front. The Austro-German forces were similarly divided into three main groups. General Hindenberg directed the Northern group, Prince Leopold of Bavaria the Central group, and Archduke Joseph Ferdinand of Austria the Southern group. The Teutonic Armies, at the dawn of 1916, had a combined strength of 1,200,000 men, which was increased to 2,000,000 as the summer advanced. Thus, from first to last, 4,000,000 men were engaged on this front in 1916. The campaign on the Eastern front had two general phases—first, the assault on the German line, from Riga to the Pripet River, in March, and second, the crushing attack on the Austrian line from the Pripet Marshes to Crernowitz, beginning in June. The March offensive was launched by the Russian Armies in the generous hope of scouring the French troops engaged in the defense of Verdun. By assaulting the German line in the East, it was expected the enemy would be compelled to relax their pressure on Verdun and perhaps transfer several army corps eastward to meet the Russian menace. Due to the unpreparedness of the Russian Armies and their fatal lack of ammunition, the March offensive proved a colossal failure. General Kuropatkin on March 2, 1916, began his campaign in the region between Lake Driswiaty and Lake Narosch by feeling out the strength and disposition of the enemy. Frequent collisions took place between the opposing armies during the ensuing two weeks, but no battle of consequence was fought. On March 18, 1916, General Kuropatkin endeavored to fracture the German line in the sector south of Dvinsk, using his limited ammunition supplies in one supreme artillery preparation. All that day and far into the night the drumfire of the Russian guns persisted, but at last the artillery fire ceased and the infantry were ordered to advance. The losses of the Russians, in the infantry attacks which followed, were fearful, being estimated at 80,000 men on a front of 90 miles. Still, without cessation, the Russian attacks continued day by day, fresh troops being brought up constantly. Eight distinct attacks, during the next four weeks, carried the Russian line forward a mile, but at a terrible cost in men. When the spring thaws set in, the Germans, along the entire Northern front, possessed the advantage of higher ground. 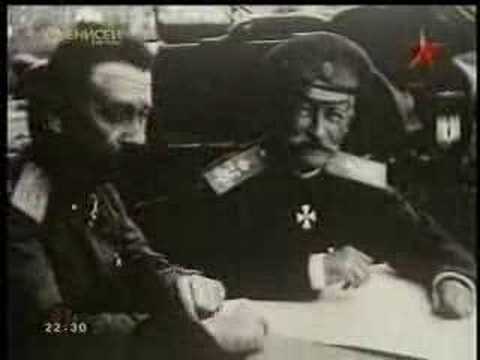 The Russians, knowing that their own trenches would soon overflow, redoubled their efforts to force the Germans back. Russian artillery carried death and destruction into the German trenches along the whole front, and many sectors of trench were taken. Successive Russian waves swept on over the heaped corpses, over the barbed-wire barriers before the German line, over the first trenches, and full upon the German soldiers, crouching half frozen in the mud of their shattered shelters. Terrible hand to hand conflicts followed. Hand grenades tore down scores of attacks. The combatants fought like madmen, with spades, bayonets, knives and clubbed guns. The Russians gained ground, but at a fearful price for so slight a gain. Having reached the first line German trenches, the Russians seemed helpless. Instead of sweeping on toward the second line, they tried to intrench themselves in the weakened first line. The German artillery fired shells of the heaviest caliber into these trenches, ripping the Russian invaders into fragments. The Russians in this ill-fated campaign lost 140,000 in killed and wounded. Meanwhile, the Russians had begun a limited offensive on the Austrian front, which slowed down by the end of March because of the river floods which inundated their trenches and the surrounding regions. The Austrians at once started local offensives at points along the line, most of which were repulsed. Artillery duels were of daily occurrence, and skirmishes between outposts, but attacks in force were rare. Resuming their offensive in April, the Russians were able to advance their positions along the Austrian front; then came a lull, due to muddy roads, until, on the last day of April, the Austrians in turn started a strong offensive north of Mouravitsky in Volhynia which gained some ground. The Russians, in a counter attack, recovered the ground and captured many prisoners. From now on until the first of June, the operations along the Austrian front, though savagely fought, were of minor importance. Meanwhile, General Brusiloff had succeeded General Ivanoff as Russian group commander in the Austrian theater of war and with him were associated the armies of Generals Kaledin, Scherbacheff and Lechitsky. The battles of the past three months had been merely the prelude to the real Russian offensive which began June 2, 1916, with a terrific artillery fire along the entire Southern front from the Pripet to the Pruth, followed by a general infantry attack along the 300-mile front. Immense masses of men were hurled against the strongly fortified Austrian lines at every important point. So overwhelming was this onrush that it swept the Austrians out of their trenches. In one day, 40,000 Austrians were captured, with 27 cannon and 50 machine guns. Advancing in swift successive waves, the Russians pressed back the Austrian Army of Archduke Joseph, twenty miles to the plain of Lutsk, taking nearly 50,000 prisoners, 77 cannon, 134 machine guns and 49 trench mortars, together with great reserves of ammunition. On June 7, 1916, the Russian artillery blast swept away 19 rows of wire entanglements, making a breach in the enemy's position near the village of Podganzy, where 3,000 prisoners were taken. Simultaneously, another Russian force, advancing on the Lutsk fortress along the line of the Dubno River, stormed the trenches of the village of Krupov, taking thousands of prisoners. The fortress itself was surrendered the same day with 11,000 men and many guns. The Austrians were now in panic flight. Field Marshal Ludendorf hastened to the scene of disaster, bringing reinforcements from Verdun. Continuing his pursuit of Archduke Joseph's army, General Brusiloff crossed the river Styr the next day, and in one sector alone, so precipitate was the Austrian flight, he captured two supply trains, 29 field kitchens, 193 tons of barbed wire, 1,000 concrete girders, 7,000,000 tubes, and a great quantity of arms. Another sector yielded him 30,000 rounds of rifle ammunition, 1,000 rifles, and four machine guns. Northwest of Tarnopol, in Galicia, the Russians seized the adjacent heights and 6,000 prisoners, while a division of raw Russian troops, just arrived on the line, forced the bridgehead near Rozhishchwa, thirteen miles beyond Lutsk, taking 3,000 prisoners and several heavy guns. The offensive along the Dniester was also successful. Advancing 12 miles, the Russians captured the villages of Potok Zloty and Scinka, seizing a large artillery park and many shells. On June 10, 1916, the seventh day of the great offensive, the Russians' flood had swept forward 50 miles, had captured one general, 1,700 officers and 120,000 soldiers, besides 124 guns of heavy caliber, 180 machine guns and 58 trench mortars. The remnant of Archduke Joseph's army was fleeing westward toward Kovel. June 10, 1916, also saw the capture of the Austrian fortress city of Dubno which gave Russia possession of the Volhynian triangle of fortresses, consisting of Lutsk, Dubno and Kovno. Still in pursuit, the Russians crossed the Ikva and pushed 25 miles westward, compelling the surrender of the garrison at Mlynow. Thus in Volhynia the Russians in one week had pushed the Austrians back nearly 50 miles. Further south, in Bukowina, General Lechitsky's army had pushed the Austrian army back, and advanced to within 14 miles of Czernowitz. In the teeth of a furious flanking fire, and despite the explosion of numberless Austrian mines, the Russians captured the Austrian positions south of Dovbronowce, 14 miles northeast of Czernowitz, taking 20,000 prisoners and ten guns. On June 12, 1916, Lechitsky's army crossed the Dniester, captured many fortified points, including Zaleszcyky and Jorodenka, 35 miles northwest of Czernowitz. Brusiloff, on the same day, had occupied Torchin, while on the Pruth sector, the Russian troops had approached the bridge head of Czernowitz. At only one point were the Austrians able to hold their line near Kolki in Northern Volhynia, south of the Styr River, where they had repulsed the Russian attacks. Both Lemberg and Czernowitz, the capitals of Galicia and Bukowina, were now threatened. 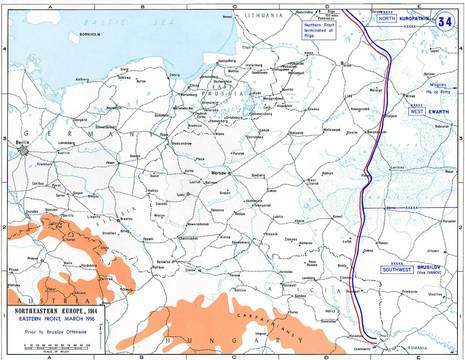 The Russians had overrun all of Southern Volhynia, advancing 45 miles on the ninth day of their offensive. The precipitous banks of the Dniester, which had been converted into a seemingly impregnable stronghold, proved no obstacle to General Lechitsky's gallant army. In the first few days of the Russian offensive, he had taken one of the principal positions between Okna and Dobronowce, southeast of Zaleszcyky. General Brusiloff's operations on the flanks of General Linsengen's Austro-German Army were proceeding with wonderful rapidity. All the efforts of German reinforcements, sent south by General Hindenberg, had failed to drive in a counterwedge at Kolki, Rozhishshe and Targowica. The Russian Eighth Army, having advanced 40 miles into the enemy's territory, were now in a position to assist the Russian thrust beyond Tarnopol and cooperate in the proposed advance on Lemberg. On June 13, 1916, the Russian advance continued along the entire 250 mile front from the Pripet to Roumania. The Austrians offered stiff resistance at the village of Zarurski and on the heights of Gaivivonka, but could not stay the advance. Pushing on to within 10 miles of the Galician border, the Russians took Kozin by storm. In Bukowina, the town of Sniatin, 20 miles from Czernowitz, was captured, putting the defenders of that capital in a perilous position. General Pflanzer-Ballin's army was routed and almost destroyed. Czernowitz, the capital of Bukowina, fell on June 16, 1916, after a six days' assault. Shells fell incessantly, day after day, causing a terrible panic among the inhabitants, mostly Jews, Ruthenes, and Poles. The final artillery attack was terrific. "It resembled a thousand volcanoes belching fire," wrote one German journalist. The Austrian guns replied with equal intensity. 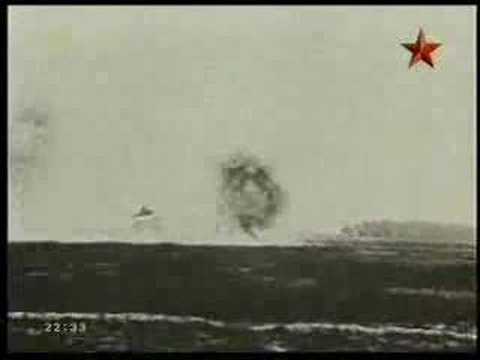 The Russians advanced in 16 waves and were mowed down. Russian columns were continually pushing back from the Pruth beyond Sudagora. Hundreds were drowned in the River Pruth. At last, numbers prevailed and the Russians occupied the town, but not until the Austrian Army had safely withdrawn. Only a rearguard of 1,000 Austrians was captured. In an endeavor to weaken the Russian attack on the Austrian line General von Hindenberg, on June 16, 1916, began an offensive on the north, from Dvinsk to Kovno, along a 150-mile front. The attack, while yielding some minor advantages, failed in its chief purpose. In order to strengthen his line, Hindenberg had been compelled to transfer several divisions from the Somme battlefield. More successful was the combined German and Austrian attack on the center of General Brusiloff's front, west of Kovel. The Russian Center was halted and 3,500 prisoners were taken. General Lechitsky's army, after the capture of Czernowitz, crossed the River Pruth in pursuit of General Planzer-Ballin's shattered forces. In several rearguard engagements, 2000 Austrian prisoners were taken, and more important still, 1,000 wagonloads of provisions and forage fell into the hands of the Russians. Large quantities of engineering material, left behind at railroad stations, also were seized by the Russians. The Russian advance in Bukowina progressed rapidly. On June 21, 1916, the city of Radautz, controlling an important railway, was captured. On the next day, three more railway junctions were seized. In a furious battle, fought at night, the town of Kimpolung was taken by the Russians on June 2, 1916, together with 3,000 prisoners, and loaded trains found in the railway station. The towns of Kivty and Viznic were next seized, and with their capture all Bukowina was now in the possession of the Russians. The retirement of the Austrians had been so hurried that they abandoned 2,500 tons of coal and great reserves of fodder and structural material. General Lechitsky, still advancing, captured Kolomea on June 29, 1916, after a furious battle of four days' duration, taking 15,000 prisoners. This victory not only endangered the remnant of General Pflanzer's army, but menaced the army of General Bothmer on the Volhynian front to the north. Two days later, in his advance on Stanislau, he stormed some strong Austrian positions, taking 2,000 prisoners. Advancing into Southern Galicia, one column of Lechitsky's army occupied the railway junction at Delatyn and seized many depots of war material abandoned by the Austrians. On July 9th, while heading for the passes of the Carpathians, Lechitsky's forces meanwhile had driven the Germans before him. In Galicia the Russian forces meanwhile had driven the Germans across the Dniester and were advancing toward Lemberg, taking thousands of prisoners and many guns. On July 30th, they were close to Stanislau. At many points along the Northern front, the Russians battered Hindenberg's line, the Germans being ejected from Niki with big losses. From June 4, 1916 to June 30, 1916, the Russians had taken 250,000 prisoners in all sectors of the battle line. Two Austrian armies — those of Archduke Joseph and of General Pflanzer-Ballin — had been routed with huge losses. In mid-June, General Lechitsky's Russian Army was threatening Lemberg from the south, while General Sakharoff's army was approaching from the north by way of Brody. The Austrian Center, under Generals Bothmer and Boehm-Ermolli, still held fast, but their flanks were threatened and the situation was serious. If the Russian Army of General Kaledin succeeded in reaching Kovel, he could drive a wedge in the Teutonic line at the point where the Austrian and German fronts joined. General von Hindenberg quickly detached several divisions from his forces on the Prussian front, sending them under General Linsengen to the aid of the Austrians. At once the situation changed. The Russian advance toward Kovel was retarded and the danger of a breach in the German line, compelling a general retirement from Poland, was for the time being eliminated. The Russians, in other sectors, were more successful. During July they had regained 15,000 square miles in Volhynia, Galicia and the Bukowina. They had taken the cities of Lutsk, Dubno and Czernowitz. The Austro-German Armies had made a stand on the bank of the Stokhod River, extending 100 miles from Lutsk to the Pripet River, of which it is a tributary. At a salient in this line, near Kovel, furious fighting was in progress early in August. The artillery fire was simply a continuous roar like thunder. At night the whole sky was illuminated by bursting shells, searchlights and star-bombs. The fortunes of battle were first with the Germans, then with the Russians, but in the end the Russians were driven back after a week of fighting. The advance toward Lemberg had failed. Undaunted by this reverse, the Russians made another thrust at Lemberg from the east early in September. The attacks were especially violent in the vicinity of Halicz. Here the Austrian line had been greatly strengthened. Seven new divisions, including three of Turkish troops fresh from Gallipoli, had been added to the original seven divisions. As the battle developed, the most sanguinary and desperate fighting which war-swept Galicia had experienced, took place, especially in the sector between the Zlota Lipa and Dniester Rivers. The Russians repeatedly stormed the strongly fortified Austro-German lines, but the resistance was so stubborn that very little advance was made. Nevertheless, before September 16, 1916, the Russians had taken 25,000 prisoners and 22 guns. After a brief lull in the fighting, the battle for Lemberg was again in full swing on October 1, 1916, all along the line from Brody to the Dniester. The Russians assaulted with great violence day after day, but made no conspicuous progress. Late in October, in a counter offensive, the Austrians wrested complete control of the west bank of the Narayuka from the Russians. During the next six weeks, the Czar's troops tried to recover the lost positions, but December 1, 1916, found the way to Lemberg still barred to them. The Russian offensive had worn itself out. 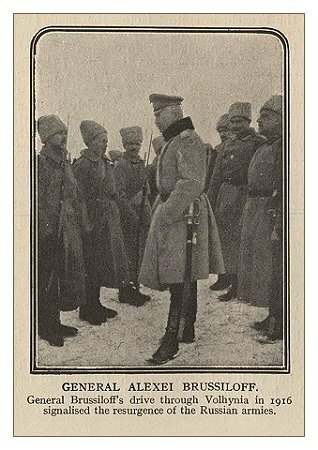 Farther north, the Russian drive against Kovel had resulted in appalling losses to the Czar's troops during September. The Russians threw themselves recklessly against the Austro-German line, but wave upon wave they were annihilated. On September 6th, the Russians attacked on a twelve-mile front west of Lutsk, but could not bend the Austrian line. Again on October 2, 1916, they tried to batter their way through to Kovel, making no less than 17 attacks on one point of the line, but without material gains. The assaults gradually slowed down during November, the Austrians holding their positions firmly. While the thrusts against Lemberg and Kovel were in progress, the Austrians launched a violent offensive along the entire Carpathian front of 75 miles; from the Jablonica Pass down to the Romanian border, but with only minor gains. South of Dorna Vatia the Russians were thrown back across the Negra Valley, but in October they regained some of the ground lost. All through November and December engagements were fought at various points along the Carpathian Hills just north of the Romanian border, but without effecting the general situation. The Russian offensive had spent itself. The Czar's troops had achieved a colossal victory in the early weeks of the offensive, taking 300,000 prisoners, 20,000 square miles of territory and an immense booty. By pressing the united Austrian and German forces in the Eastern theatre of war, the Russians had compelled the withdrawal of enemy corps from Verdun, the Somme, Gallipoli, and Italy. In this way Russia had aided if not saved the Allies. But she had done it at a great sacrifice. So prodigal was Russia's expenditure of man-power that her casualties must have exceeded 500,000. It was Russia's swan song, for the forces of anarchy were now undermining the pillars of state and the Czar's mighty empire was destined soon to fall in irrevocable ruin.